Biomarkers present in your blood will be measured once per quarter year (every 3 months) or biannually (every 6 months) to assess changes over time. A one-time test is also available. This report is sent to you after each analysis is completed. It provides you with a current snapshot of your blood biomarker levels and how they compare to past assessments and population normal ranges. Establishing your personal biomarker baseline with routine, periodic examination is valuable as it provides a reference level that can be used to observe trends and detect changes that may indicate possible improvement or decline in your overall health and wellness. It is recommended that you share your analysis report with your healthcare provider who can more thoroughly advise you on your current health status based upon this report and your medical history. The report is presented in graphical format for ease of interpretation. 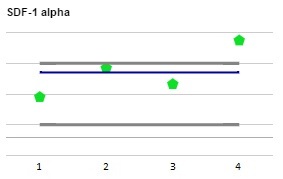 Each graph indicates the level of an individual biomarker and how that level changes over time. Your personal baseline, which is an average of the individual biomarker levels that were taken at different time points, is also shown. This line will change and become more refined the more times your blood is assessed. In addition, the graph indicates the population normal range as assessed from scientific literature and through population statistics. Clicking on the individual graphs will direct you to a scientific resource with additional comprehensive, high-quality information about each biomarker. The graphs in the report are split into 3 categories (see below). 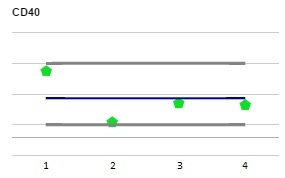 The most recent assessment measured a biomarker level well above the baseline that was built from previous tests. Biomarker levels that are currently or have been significantly different from your personal baseline levels are shown first in the section labeled Biomarkers Oustide Your Personal Baseline. These biomarkers have significantly differed from your personal baseline in the most recent assessment or were significantly different from your personal baseline in past assessments. These biomarker changes might be of the most interest for you to speak with your healthcare provider about. The most recent assessment determined a biomarker level was outside of the population normal range. 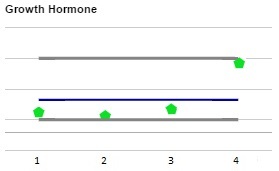 Biomarker levels that are currently or have been previously outside of the population normal range are shown in the next section labeled Biomarkers Outside Normal Range. These biomarker changes might also be of interest for you to speak with your healthcare provider about. All 4 assessments of this biomarker have measured levels within the population normal range. 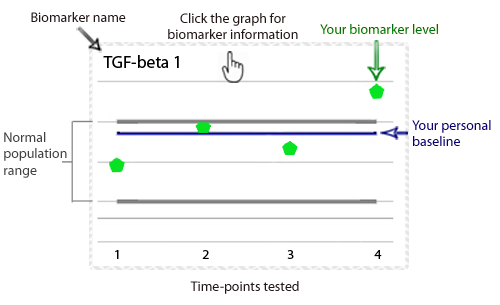 Biomarkers that are and have been consistently within the population normal range and have not significantly changed from your personal baseline are shown last in the section labeled Biomarkers Within Normal Range.